The leg 2 checkpoint was at a pretty nice hotel and I had a nice room on the top floor where I think I sleep better. The alarm went off and the phone rang as I had also setup a wake up call just in case the alarm on my cell phone did not work. Damn, it was already 5:15 AM, I am sure I could have slept another day or two. I slept pretty hard and did get some good rest and I am glad I did as I knew I needed to step it up in this leg if I wanted to make a move. I got up and put on my riding gear and headed downstairs to see if there was anything to eat and be there for the rider meeting at 6:00 AM. I got a cup of coffee and talked to a couple of others who were already there waiting. There seemed to be an issue with something as Mike Kneebone, Steve Hobart and a few other IBA staff were talking to some of the riders. Mike eventually asked all of the riders who went to the Pennsylvania Trolley Museum bonus to line up so he could talk to them one by one. I mentioned that I went to the bonus but was so early I did not want to wait and I left not waiting for the bonus window to open and scoring the bonus. Once the rider meeting got started Mike was pretty upset and made sure everyone understood what was expected of us and that he was very unhappy with some of the actions of a couple riders. Eventually the bonus list were handed out and I quickly headed up stairs saying good luck to the riders I passed on the way to the elevator. I wanted to be on the road as soon as possible to use all of my time on the clock. 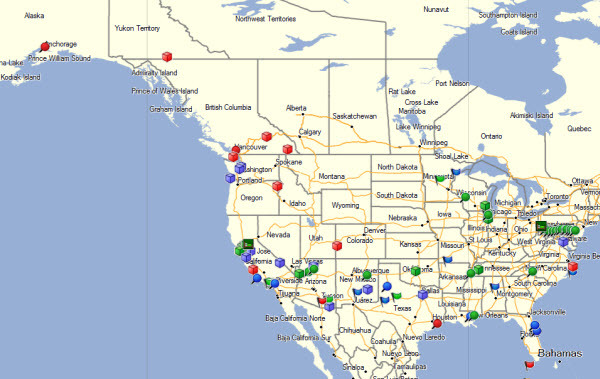 Here is what I saw on the map once I coded the bonuses how I normally do. To me it was pretty obvious what direction I was going to be headed as there were many more bonuses with a southern route than a northern route. This would give me more options in the event I had a problem and if I went north I had that little issue of getting into Canada. It took me about 30 minutes to number and code all of the bonuses ( I always input all of the bonuses for each leg as I learned a lesson not doing that in a previous rally ) in Mapsource. I then saved the information as a GPX file and then imported the GPX file into Streets & Trips ( S&T ) to do some route planning. I used S&T as I can also add stopped time and rest bonus time. Once I did this I had a pretty good albeit an aggressive route that I then loaded back into Mapsource to load into my GPS's. I do this so I can load the bonuses with the waypoint icon that I set it to into the GPS, they then show up that way on the GPS screen. This makes it easier to understand the value of the bonus and if it is a daylight only bonus. If I wanted to reach my goal ( top 10 ) I needed to make a big move in this leg so I had to be aggressive in my route planning. The biggest bonus once again was Key West ( excluding the 2 sucker bonuses up in Alaska and the Yukon ) which I have a kindness for since I lived there in the late 1970's and early 1980's. Like in leg 1, I had Key West in my planned route only this time it was a better option than in leg 1 and would be harder to change my mind about it once on the road. I planned my route and loaded up and hit the road. It took me a couple hours once I received the bonus pack so I was a little behind schedule already. Leg 3 Notes: I had big hopes for leg 3 after planning my route. I really thought I could move up in the standings if I could ride my planned route. It was very ambitious and a lot of miles for 4 days with all of the daylight only bonuses and the long rest bonus that was available for this leg. It did not take long for me to realize that my planned route was not really doable even for non-humans like me. It was very HOT the first 3 days even at night. The wings temperature gauge was above 105 the first 3 days. 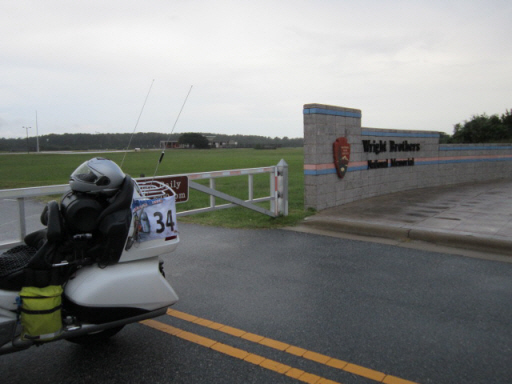 There was heavy rain in North Carolina starting west of Charlotte on I-85 all the way to the Wright Bothers National Memorial bonus on the outer banks. There was 3 bad accidents around Charlotte that really slowed traffic and me which had me wondering if I was going to make the daylight only Wright Bothers National Memorial bonus. I did make it with about 20 minutes to spare. 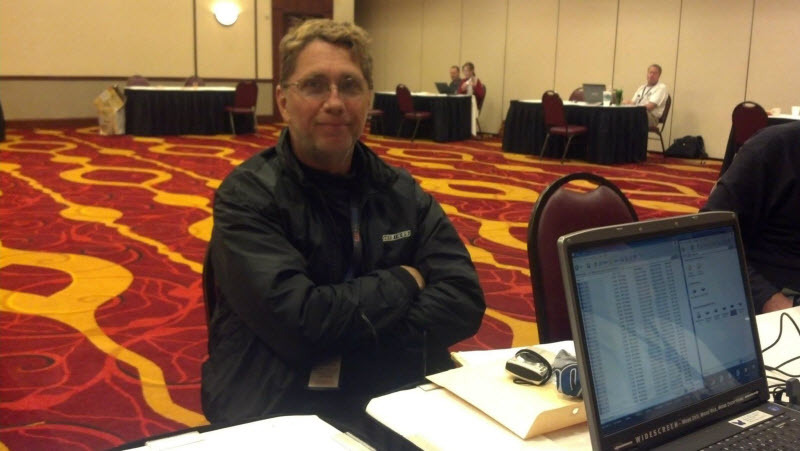 One thing I noticed after the rally was that I should have routed to the big bonus in Colorado based on what some other riders did like Craig Brooks. My Initial Leg 3 Route: I thought the route I planned after getting the bonus list would be the winning route and maybe it would have if it was possible to ride that route and make it back to the checkpoint on time. I was thinking I could pick up 5000+ points or more depending on what route other riders rode. 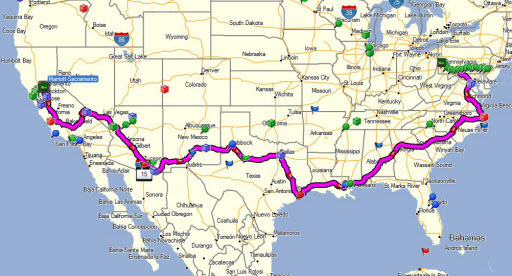 This was a 5400+ mile route that would be hard due to all of the daylight only bonuses. 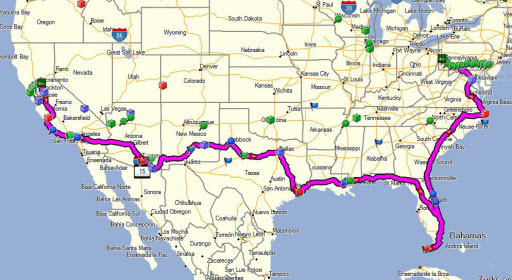 My Actual Leg 3 Route: This route is very close to the route I created after receiving the leg 3 bonus list except for a couple bonuses in California and Key West. I swapped the couple California bonuses for the Death Valley bonus and dropped Key West once I realized I could not make it back in time. It would have been 5370+ miles in 4 days and not really doable even how I ride. The daylight only bonuses and the high point 8 hour rest bonus really prevented hitting all of the planned bonuses and making it to the finish on time. Bonus Requirement: Take a photo of the sign that shows the proprietors' names. This bonus was pretty close to the start of leg 3 and when I arrived there was 3 or 4 other riders there. Some suggested that your motorcycle had to be included but the instructions did not mention that. It cost me 10 minutes as I wanted to be sure I was taking the right photo. Bonus Requirement: Take a photo of the Lockheed TF-104G Starfighter located at the entrance to the museum. This was my second bonus of leg 3 and it was closed. When I arrived at the bonus I was the only rider there so I started looking around for another entrance and could not find one. After about 10 minutes others rider rode up and I decided to call the RM ( Lisa Landry ) to let her know it was closed and that I was taking photos to prove that it was closed. The other riders also did the same. Eventually someone drove out the gate and said this place is normally closed on this day. With the other riders taking the same photo I was pretty sure I was going to score the points as long as I did not screw up at the scorers table. I think I lost another 15+ minutes here trying to be sure I was at the right place and that it was closed. I was now already 20+ minutes behind schedule and it was damn HOT out. The temperature gauge on the wing was showing 107. I decided now to change my route and head for Death Valley and the bonus there as it was a 2502 point bonus and just about as many points as picking up some of the other California bonuses. Bonus Requirement: Take a photo of the 20 mule team wagons. I knew it was going to be hot ridding to Death Valley but not this hot. The highest temp I saw a 121 on the wing. Man it was hot and I was using a lot of water to keep cool and hydrated. I was going to need more ice and water when I got to the bonus. I knew there was a store and gas station there. This was a daylight only bonus and I was running a little late so I had to keep my pace up to be sure I made it on time. I ran into Todd & Diane LeClair on the way to the bonus and we rode the last 100 miles together. It was good to be ridding with someone on the way to this bonus as it was hot and incase something happened there would be someone around to help. 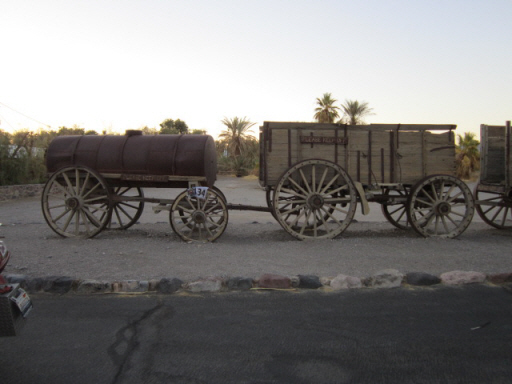 The bonus was at Furnace Creek Resort, not sure who thought of putting a resort in the middle of Death Valley. I arrived around 8:00 PM local time along with Todd and Diane at the bonus which still left me a couple hours of daylight. We hung around for a while trying to cool off, buy ice and water and get gas as it was a long ride to Tucson. 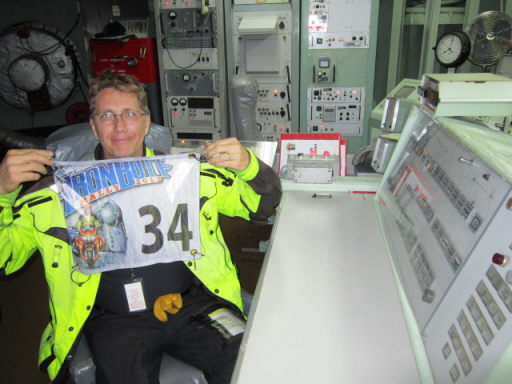 Bonus Requirement: Get your picture taken in the command seat of the missile silo. From Death Valley I headed for the Titan Missile Museum near Tucson, AZ. On the way to the bonus I had to ride through Las Vegas and then down US 93 to Tucson. I rode with Todd and Diane for most of the way to this bonus. I also saw Kevin Lechner on US 93. We eventually split up when we stopped to rest at a gas / fast food place. We slept in the booths of the fast food section for about 3 hours. I got back on the road and pushed on for the bonus wanting to be there a few hours before it opened to get some more rest while waiting for the bonus window. I arrived around 6:30 AM local time and there was one other rider ( Derrick ) already there. I found a picnic table and laid out on it to try and get some sleep as I had 2 hours before the bonus window opened. I must have fell asleep as some said I was snoring. During the next 2 hours about 25 other riders showed up. This became a concern for the operators of the museum as they have never had so many show up early waiting to get into the museum. We worked out a process of how we could accommodate all of the riders getting their picture in the command seat as the bonus required. Bonus Requirement: Take a picture of the Shady Dell sign. This bonus was about 100 miles to the southeast of the Titan Missile Museum bonus and was mostly on small two lane roads. Once I was in the area of the bonus I got turned around and the GPS was not routing me right as it had me missing the road to turn on. 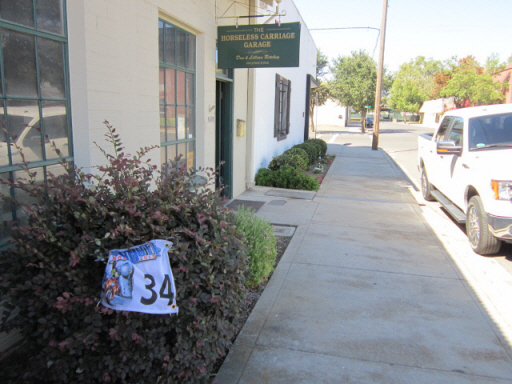 The bonus was on a small side road in a small town and I lost 20 minutes looking for this bonus. Bonus Requirement: Take a photo of Ham's gravestone. It was 220 miles to this bonus and it was hot and I was not making very good time as I was riding through small towns on the way. 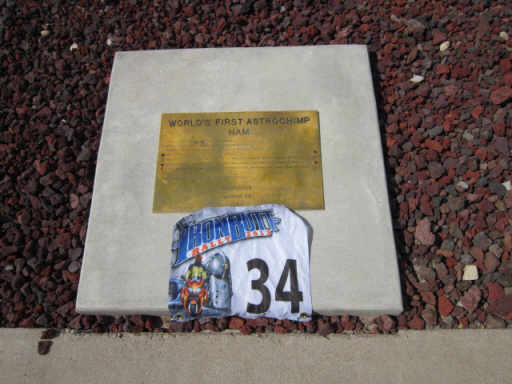 Finding the bonus location was not hard but it took a few minutes to find the small plaque in the ground. 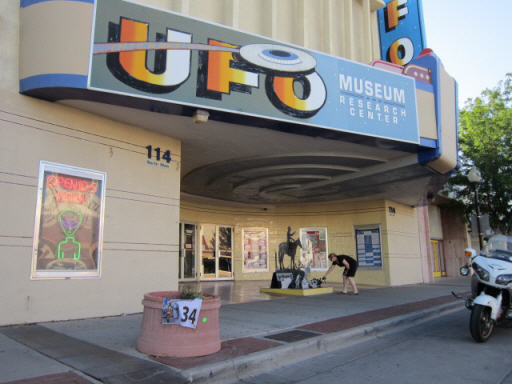 Once I got my photo I was on the road pretty quickly headed for the UFO Museum in Roswell, NM. Bonus Requirement: Take a photo of the front of this house of kitsch. This was one of the easier bonuses to score in this leg. The GPS took me right to it with no issues and it was easy to park in front and get my photo. From here I headed for the Silent Wings Museum which was a 24 hour bonus. It was a good thing because I was not going to get there before dark. Bonus Requirement: Take a photo of your motorcycle in front of the Museum. This was the first 24 hour bonus in this leg for me and it was good as I arrived about 30 minutes after sundown. I saw Steve Bennett, Tim Masterson and a few other riders here also. I was going to start headed south for the ferry bonus in Galveston from here but decided to head for Dallas and the Big Boy 6 bonus after a little time with the GPS. I also could get my rest bonus on the way to Dallas. It was small two lane roads all the way to Dallas and I was not making much time. I was getting pretty tired and started to look for a hotel. 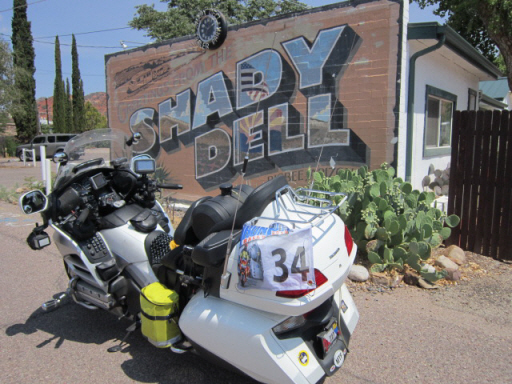 There was only mom and pop hotels on the road and as I was riding into a small town called Seymour, TX I saw Tim Masterson pulled in to a small hotel and I decided I might as well stop were another rider was in case anything happened. This hotel was not much better than a park bench in a rest area. This was a hard bonus to get to as the GPS took me right through down town instead of around on the highway. Since I was not from the area I had to follow the GPS to the bonus. If I would have zoomed out a little on the GPS I may have seen that I could have stayed on the highway much longer instead of riding right through downtown where it was hot and a lot of traffic. It was also hard to get back on the road headed for the next bonus as I got a little turned around and had to back track twice because of the GPS trying to take me down roads that were either closed or not there. I ran in to Sal here and we rode together for the next 3 bonuses. It was damn hot as we headed south on I-45 for Galveston. 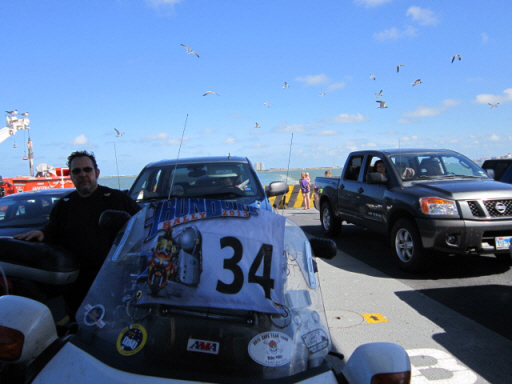 Bonus Requirement: Take a photo of your motorcycle while underway on the ferry. Bon voyage! 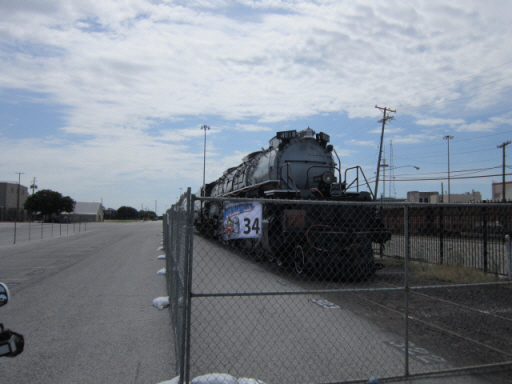 It was a pretty easy but hot ride to Galveston and when we pulled up to the ferry terminal. There was a line of traffic already waiting for the next ferry. We waited about 40 minutes before the next ferry arrived and we were not sure we was going to get on as there was a lot of cars in front of us. We did get on and the ferry took off for Port Bolivar. It was maybe a 30 to 40 minute ferry ride and plenty of time to take the required photo. It was much cooler out on the water and felt good to take of my jacket for a little while. This was a big bonus and felt good to score it. From here Sal and I headed for the Lake Pontchartrain Causeway bonus which was about 350 miles away. Bonus Requirement: Get a toll receipt southbound on the Causeway Bridge and and a receipt from Metairie, LA. 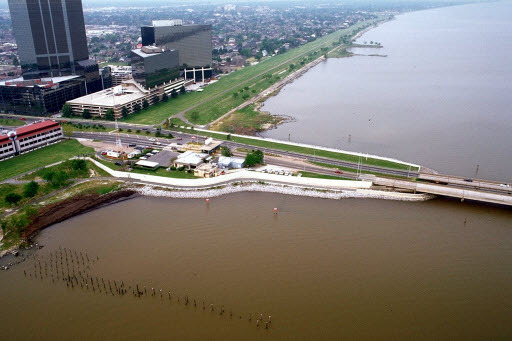 This bonus required you to ride across the bridge from the north and get a receipt on the south side in Metairie, LA. If you was not careful your GPS would route you to the south side of the bridge and you would have had to ride the bridge in both directions to score the bonus. It is a long 26 mile ride across the bridge and it was around 10:30 PM local time when I arrived a the bridge to pay the toll and get a receipt. 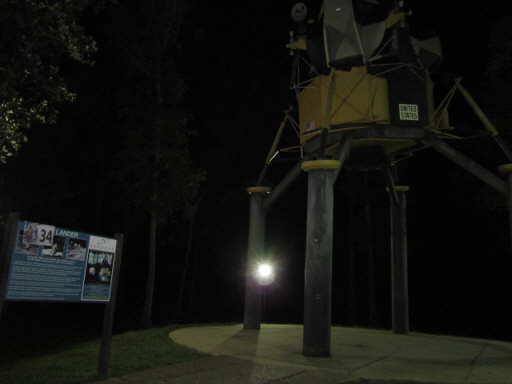 Bonus Requirement: Take a picture of the Lunar Lander. This bonus was only 40 miles from the north side of the Lake Pontchartrain Causeway and was pretty easy to find and get my photo. This is where Sal and I split up as he was headed in a different route to the Wright Bothers National Memorial bonus than I was. I think Sal hooked up with a couple other riders who were also at the bonus. 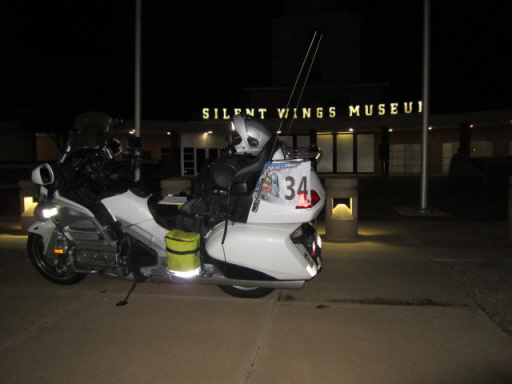 It was a 1040 mile ride to the Wright Bothers National Memorial bonus and I had about 16 hours to get there and I would need a couple hours sleep along the way. My intention was to bag a 350 point bonus near Charlotte, NC along the way but as I got closer to it time was running short and it was raining pretty hard. There also was 3 accidents on I-85 near Charlotte so I dropped the bonus and kept headed for Kill Devil Hills, NC. Bonus Requirement: Take a picture of the strip of land where the first flight occurred and make sure your motorcycle is in the picture. This was a daylight only bonus as I was pretty worried that I was going to make it. It had been raining for the last 300 miles and there had been a lot of traffic. The last 160 miles was on a two lane road out to Nags Head. I finally arrived at 8:00 PM local time and had maybe 30 minutes to spare. 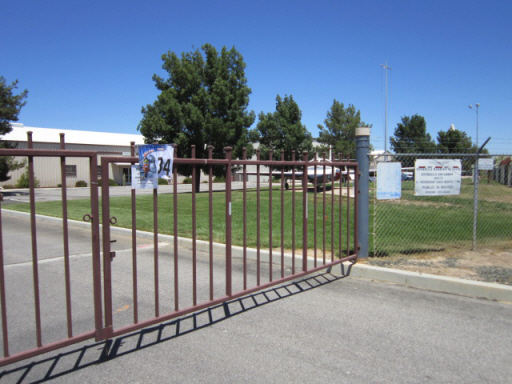 When I arrived I saw Philip Weston there and the gate was closed and locked. I was not able to take the required photo due to the place being closed at 5:00 PM. This was a daylight only bonus so I followed the proper way to document the bonus with multiple photos showing the place was closed. 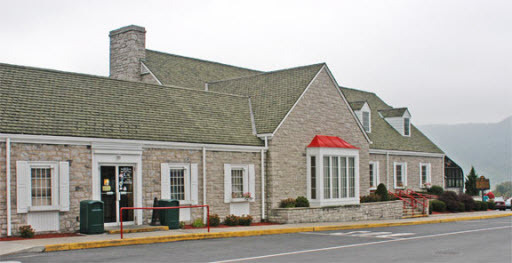 Bonus Requirement: Make a purchase and obtain a receipt identifying this Turnpike Plaza. 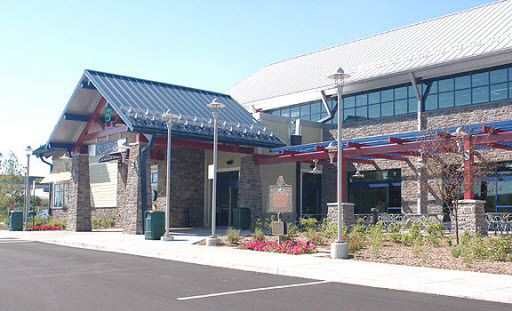 My last three bonuses was Turnpike Plaza's on the Pennsylvania turnpike. There was about 5 of us hopping from plaza to plaza on the way to the finish. By now I new I was going to be a finisher and would do pretty well but I did not know how well until the banquet. Spotwalla Tracking Map: Leg 3 Spotwalla tracking map. I rode 4470 miles in leg 3. This put me over the 11,000 mile mark which was one of my goals for the IBR.